3. Payments by debit or credit card will incur a 5% administrative charge up to a maximum of £25.00. 4. Midweek breaks between October and March include entertainment passes (SELECTED CARAVANS / LODGES ONLY), details of entertainment passes and how to collect the keys will be sent to you once final payment made. No refund will be given if you book the incorrect caravan / lodge. 5. Please ensure that you check all correspondence for accuracy. Any changes made to your booking after it has been processed will incur an amendment fee of £10. If the guests on the booking form alter from the guests staying in the caravan / lodge or if extra guests arrive, these are not be allowed into the caravan / lodge. Cotty’s Caravans reserves the right to terminate your booking and no refund will be given. 6. Check In 15:00 and Check Out 10:00 (except Elms Drive 4 Check In 14:00 and Check Out 9:30) if you require a different time this may be accommodated by contacting Cottys Caravans. 7. No groups under 20 years of age. 8. The keys for the caravan / lodge are your responsibility whilst you are staying, so if you lose the keys a charge of £10.00 will be charged. 9. Please be aware that nearby is a working air force base at Conningsby. This is exciting as well as noisy; please ensure you do your research before booking as jets and aircrafts fly over the park daily. If you find this uncomfortable during your stay a refund is not warranted and will not be given. If you wish to leave early, this is your choice and only the bond will be returned. 10. Should accommodation booked become unavailable for any reason we will offer an alternative for a similar price, if this is not acceptable you will lose your deposit, BUT if none are available for the same date a full refund will be issued. 11. 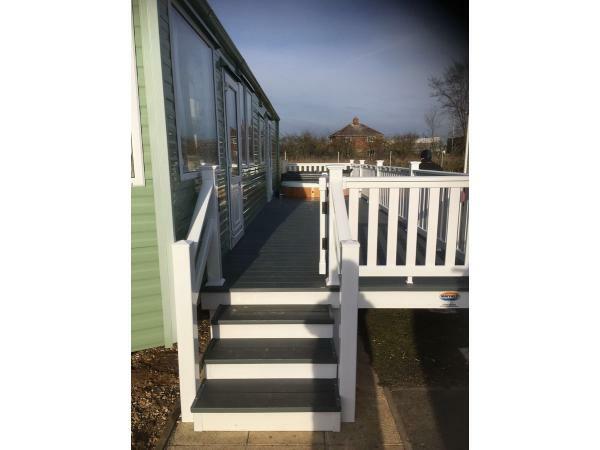 Cottys Caravans may upgrade caravans / lodges with new features / fittings; Any bookings which have already been taken will be notified of the new rate. If this new rate is not acceptable, Cottys Caravans will offer an alternative caravan / lodge for the same value which may not include the same features or fittings as previously booked. If this is not acceptable you will lose your deposit, BUT if none are available for the same date a full refund will be issued. 12. Not all of our caravans / lodges are new, we do have older caravans too which are still well maintained and are priced accordingly. If you are unsure on which caravan you are booking please ask as no refund will be given if you have booked an older caravan but want a new one. 13. Refunds are not given on your personal opinion of the caravan / lodge. If you do not like the colour of the wallpaper or carpets etc. a full refund is not warranted and will not be given. If you don’t like the caravan and wish to leave early, this is your choice and only the bond will be returned. 14. The maximum number of guests should not be exceeded at any one time. If the caravan is a 6 berth, then only 6 people are permitted in the caravan due to insurance purposes and the strength of the caravan. If it’s an 8 berth, 8 people and so on. Should you exceed the maximum occupancy you risk your booking been terminated and no refund will be given. You will forfeit you bond. 16. 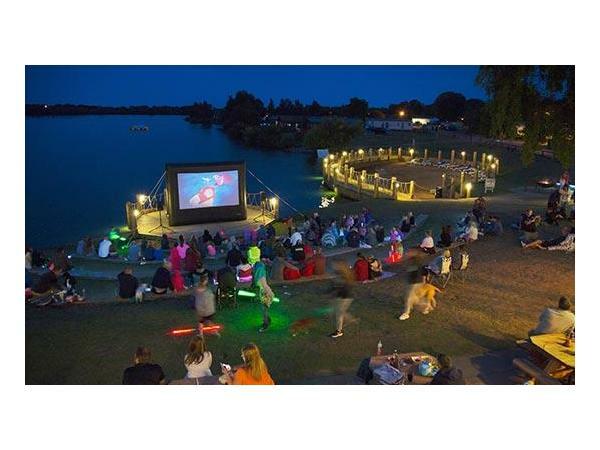 Only guests staying at Tattershall Lakes Country Park can purchase entertainment passes to use the facilities within the Merlin Centre. These can be obtained at Guest Services. 17. Pets are welcome at most of our caravans / lodges. The cost per pet is £10.00. We ask that you keep your pets off the furniture and beds. If you know they are going to climb up, please take a throw with you. Any damage caused by pets will result in your bond been forfeited. No pets are to be left unattended in the caravans / lodges unless a cage is provided. Please keep dogs on a lead at all times whilst on the parks and please clean up after them. We do have caravans, which are NOT pet friendly too. 18. No smoking is allowed in the caravan / lodge. PLEASE NOTE IF YOU SMOKE IN THE CARAVAN / LODGE YOU WILL FORFEIT YOUR BOND. Please do not leave cigarette buds around the caravan / lodge this will not be tolerated and 10% of you bond will be kept for the cleaner. 19. We Cotty’s Caravans can accept NO liability for anyone using the hot tub; these are used at your own risk. Safety guidelines are issued in all our caravan / lodges. Please read these carefully before using the hot tub. 20. Glasses are not to be used near the Hot Tub. Any evidence regarding the use of glasses near the hot tub will result in a full drain down of the tub to check for glass. This will result in YOUR FOFEITING YOUR BOND. 21. If you request a visit from our maintenance team regarding the Hot Tub and this is not warranted. A charge will be levied of £20.00 Monday to Friday 9:00 to 5:00 and £40.00 any other time. This will be deducted from your bond. 22. On your departure the hot tub will be checked by our maintenance team. PLEASE NOT IF THE HOT TUB HAS BEEN MISUSED IN ANY WAY YOU WILL FORFEIT YOUR BOND. The misuse of the hot tub will be photographed as evidence. 23. Gas and electric is included in the total cost of your holiday, we do however have a fair use policy with gas bottles. Should the gas bottle run out during your stay we would replace it ASAP. Please be aware that sometimes these cannot be delivered straight away. However, should you use the full replacement bottle during your stay we will not replace it unless there is a fault with the fittings. Gas fires should not be left on overnight, or when the caravan is not attended. 25. Should any instances occur where a member of your party are asked to leave the site, all the party will be asked to leave and no refund will be given. 26. If security or the police are called out to the caravan / lodge we reserve to right to terminate your booking immediately and no refund will be given. Cotty’s Caravans will not tolerate any upset to other caravans / lodge owners. 27. Parents/Guardians have the responsibility of supervising their children at all times. To ensure the safety of their children whilst in the caravan / lodge. It is also the responsibility of the parents/guardians to inform Cotty’s Caravans upon arrival of any dangers in the caravan specific to their children that may need attention. 28. Drugs MUST not be taken in any of our caravans / lodges. Any evidence of any kind of drugs been taken in the caravans / lodges will result in the bond been forfeited as the caravan / lodge will need a deep clean. This information and evidence will also be passed onto the police. 29. Cotty’s Caravans cannot be held responsible for any issues, which are beyond our control. If there are any issues with the site, please notify us and we will try our best to help. Please note bins do get full this is not something we can control, as it’s the sites responsibility to arrange for them to be emptied. Barking dogs are not something we can control either. We expect owners to be considerate and not allow their dogs to continually bark. Car Parking bays are provided. One space for caravans and two spaces for lodges. We ask all guests to be considerate when parking. 30. Cotty’s Caravans cannot be held responsible for forces of nature, flies, spider webs, wildlife, falling leaves etc which are beyond our control. 31. Any changes to the advertised entertainment or facilities at the park are beyond our control and we cannot accept any responsibility or liability for this. 32. We Cotty’s Caravans can accept NO liability for any loss or damage to cars, belongings or personal injury occurring whilst staying in our caravans / lodge. Please purchase your own holiday insurance if you require it. 33. Cotty’s Caravans cannot be held responsible for any damage or loss caused by the use of hot tubs, washing machines, dishwashers, televisions, dvd players, play stations, free view boxes, boilers, microwaves and fridge freezers etc. Cotty’s caravans cannot be held responsible should one of these items not work or breakdown but will do our best to repair or replace the item as soon as possible. The conditions of these items are based on the usage of paying guests. Every effort will be made to repair any equipment that is faulty or has stopped working. Cotty’s Caravans will not make any refunds for items not working. 34. All beds have mattress protectors (these are not waterproof), which must NOT be removed at any time. Any mattresses soiled or damaged will have to be replaced using your bond. 35. Bed linen is provided on all bookings this is not negotiable. 36. 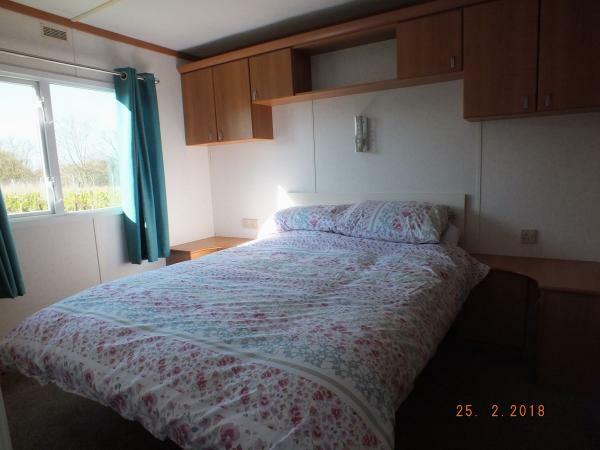 The caravan / lodge must be left in a clean and tidy condition. The hirer is responsible for all members of the party and must make good any losses, breakages, or damage done to the caravan or its contents during their stay. 37. Check out must be made before 10am on the day of departure and keys returned to reception or key safe. Check in for all caravans and lodge’s is 3pm on the day of arrival without prior arrangement from Cotty’s Caravans. This is to ensure that each caravan / lodge can be cleaned and checked. Should you require a later check out or an earlier check in, please speak to Cotty’s Caravans and we will do our best to accommodate. Any guests arriving early or departing later will be charged and risk forfeiting their bond. 38. Privacy Statement: We do not store your financial details; once your bond has been repaid your details will be removed. 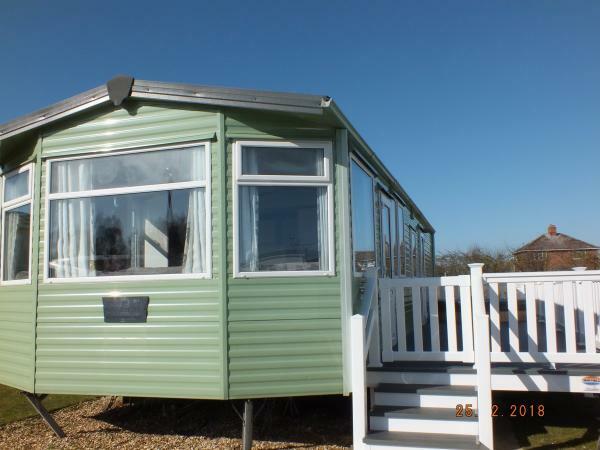 We will not sell or use your details other than to inform you about Cotty’s Caravan’s offers. 39. By booking and paying for your holiday you are accepting the terms and conditions listed above. In the case of any dispute Cotty’s Caravans decision is final. 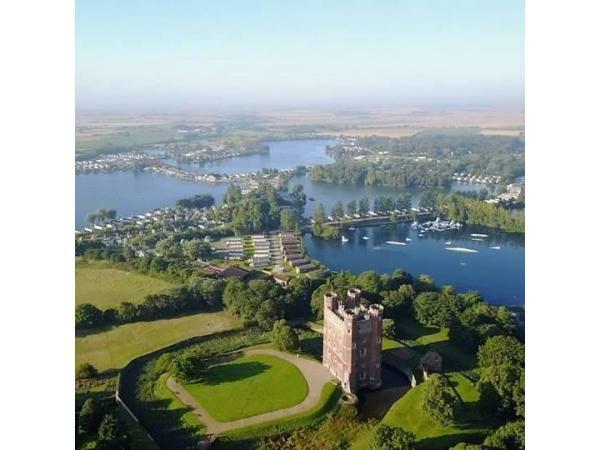 What a fabulous family caravan with all the extra touches to ensure you have a great stay at Tattershall Lakes Country Park. 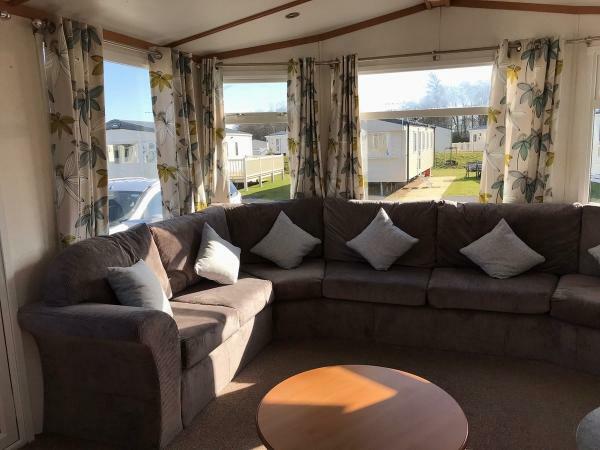 The lounge has a pitched roof with spotlights and large windows front and side which lets light access this fabulous caravan. There is a wrap around settee which has a sofa bed and has recently been re-upholstered. A 32" TV with DVD player (please feel free to bring your own DVD'S). Lovely décor throughout with an attractive gas fire and feature surround and large mirror. Please feel free to use the games, books and DVD's. 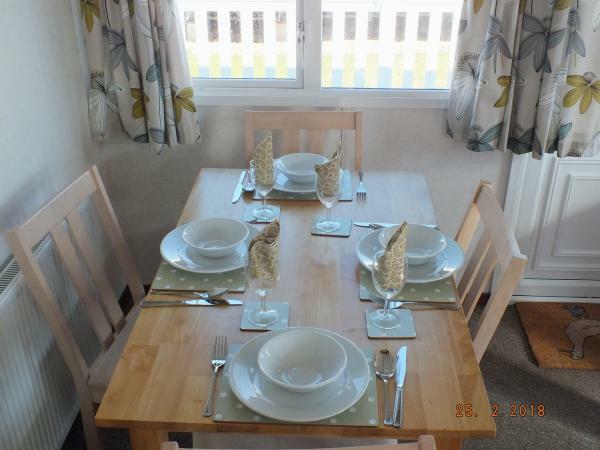 The dining table is set in its own private area of the caravan with freestanding chairs and is a great place to sit and watch what everyone else is doing around the caravan. Everything for the kitchen you would need is provided pots, pans, cutlery, glasses etc. There is a freestanding microwave, fridge with freezer compartment, oven and grill with 4 ring gas hob. Worktop space to make that perfect meal. The master bedroom suite is very spacious, with a double bed and bedding. Double wardrobe with large mirrors and a sets of drawers. Two bedside cabinets, power sockets and central heating radiator, with direct access to the bathroom. Bedroom 2 has two single beds with bedding, cupboard space above plus bedside cabinet, power socket. Single wardrobe. Mirror for doing hair and makeup plus a central heated radiator. The bathroom has a large shower, pedestal sink and WC, central heated towel radiator and vanity mirror. Outside is a very large veranda and patio furniture. You will find a hoover, mop, sweeping brush and a few cleaning essentials under the sink for you to use during your stay. There are some basic condiment's in the cupboards which can be used and replaced as necessary. 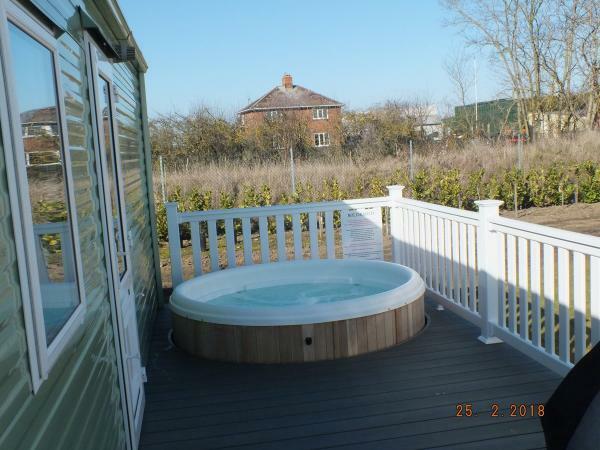 Also included in the cost of your caravan for you to use is a luxurious hot tub with large veranda, please ensure that the hot tub cover is put on after use. Also, ensure that you read the guidelines for using the hot tub as these are there for your safety and others. We cater for everyone and guarantee you will love the outdoor spaces just like my own. 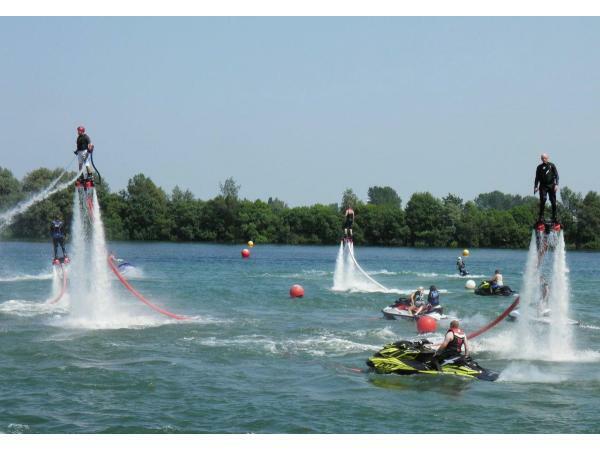 If your looking for a fantastic break with lots to do, then this is for you. 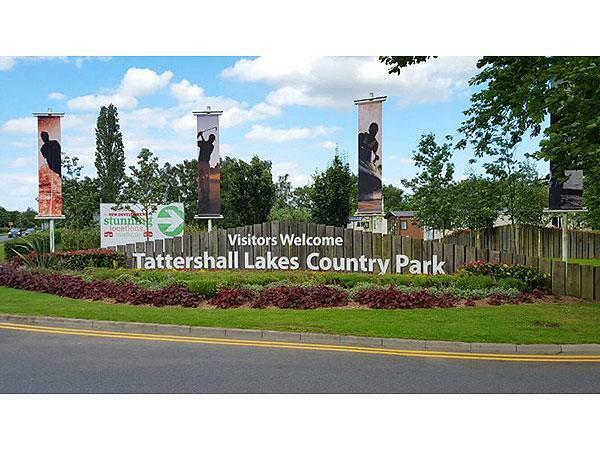 Enjoy your stay with all the extra's that Tattershall Lakes has to offer. Additional Info: Pub/Club, Fishing, Amusement Arcade, Indoor Pool, Laundrette, Grocery Shop, Restaurant, Kids Club, Access to Spitfire Diner & Bar, Sauna, Steam Room, Hot Tub (For Adults Only Located Near Indoor Pool), My Active - Balanceability, Archery, Hoverball, Archery, Parent & Toddle Pool Time, Target Paintball, Waterwalkerz, Body Zorbing, Pool Kayaks, Crossbow, Raft Building, Cheerleading, Zumba Fitness, Axe Throwing, Enhanced Laser Tag, Hover Boards, Land Zorbing, Easy Breath Snorkelling Jet Ski's, Wakeboarding, Water Skiing, Swimming Lessons, Aquacise, Bike Hire.